Israeli man killed in Arab terror attack Sunday identified as 19-year-old IDF sergeant Gal Keidan. 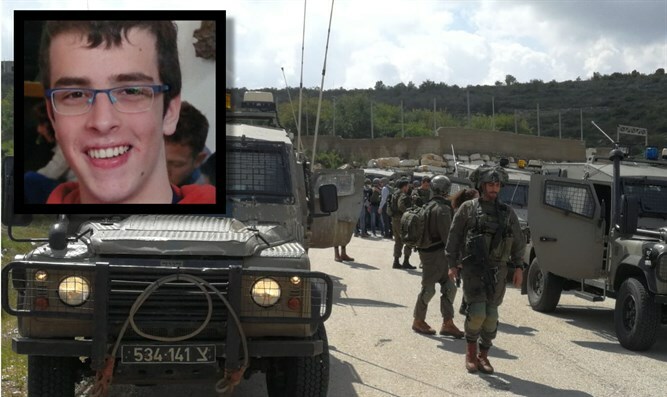 The Israeli man killed in a combination stabbing and shooting attack in Samaria Sunday has been identified as a 19-year-old IDF sergeant from the southern Israeli city of Beer Sheva. An IDF spokesperson said the man killed in Sunday’s attack was 19-year-old Gal Keidan, a sergeant in the Israeli army’s 334th artillery battalion. Following the attack Sunday, Keidan was posthumously promoted from the rank of sergeant to Staff Sergeant, the IDF said. He will be laid to rest at the military cemetery in Beer Sheva Monday morning at 11:00. Keidan was stabbed and killed by an Arab terrorist during the attack at Ariel Junction Sunday morning. A second soldier was seriously wounded Sunday, when the terrorist cell responsible for the attack at Ariel Junction opened fire at the Gitai Avisar Junction west of Ariel. A third Israeli, 47-year-old Rabbi Ahiad Ettinger, was also wounded in the attacks Sunday morning. The terrorist then shot Rabbi Ettinger, and at Gitai Avisar Junction, shot a second IDF soldier. Rabbi Ettinger is listed in critical condition, while the second IDF soldier is in serious condition.